Read our helpful guide to second hand Aston Martin Rapide. AA Cars works closely with thousands of UK used car dealers to bring you one of the largest selections of Aston Martin Rapide cars on the market. You can also browse Aston Martin dealers to find a second hand car close to you today. 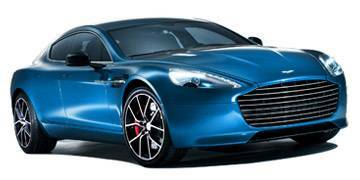 All used Aston Martin Rapide on the AA Cars website come with free 12 months breakdown cover. A four door saloon with four seats, the Rapide wears the typically sleek Aston look, but is elongated and stretched to accentuate its smooth curves. Its added practicality (i.e. its backseats and boot), aren't quite as spacious as a typical saloon, but it is a hefty addition to a regular compact Aston Martin output. Its performance is more in line with the rest of their range, and while it isn't as quick as the Porsche Panamera Turbo, it still hits 60mph from rest in under five seconds, has a top speed of 190mph and handles beautifully. It might be priced far out of the league of many who might ordinarily consider a saloon, but it offers a lot more speed, power and excitement.